Hall-of-Fame quarterback Dan Marino once did a TV commercial endorsing Isotoner gloves. In it, he gifted gloves to his offensive linemen, who were responsible for keeping Marino from getting sacked every Sunday. Just like an offensive line, everything a grower hopes to accomplish starts with soil health. Equipment, top-of-the-line seed, expensive fertilizer — healthy, productive soil makes all of it more effective. “Really, it’s about ROI (return on investment),” said Edwin Suarez, agronomist at Midwestern BioAg. Suarez gave a presentation on soil health during Potato Expo 2019 in January. Healthy soil practices lead to more organic matter compound, which makes for easier soil to work with and losing less of it. Less erosion and runoff, higher nutrient and water absorption are traits of soil with high organic matter compound. Suarez cited several areas farmers can focus on to improve the biology of their soil. None of these are new developments, Suarez said. All of them are known to impact biological efficiency in soil. The variables are the history and current state of the soil and to what extent a farmer is willing to invest in the known technology. “People always ask, ‘Should I drink the Kool-Aid on soil health, or should I just dip my toe in?’” Suarez said. “It’s both. Mentally, you should drink the Kool-Aid. You have to prepare. You have to study. You have to go to workshops. The dipping the toe in part comes in early financial investment. Growers should analyze their systems and focus on small changes first, Suarez said. Soil health is two-fold. It’s not only about what can be done to improve the biology within the soil, but also what should be avoided, or at least minimized, to keep from breaking it down. Suarez noted cover crops, compost, carbon-based fertilizers and bio-stimulants among ways to increase organic matter. While tilling and fumigation may be necessary for potato growers, they are areas to closely monitor. 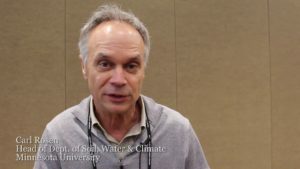 Grant Cardon, professor and Extension soils specialist at Utah State University, recently spoke at the Idaho Potato Conference in Pocatello. He noted that once organic matter starts to break down, erosion, weeds and disease are likely to follow. Once organic matter input ceases, soil structure has a half-life of 0.2 years (a little over two months). “Organic matter additions are important whenever possible,” said Cardon, adding that mineral fertilizers alone won’t make up for the absence of added organic matter. In addition, Cardon said conventional tillage practices break down natural organic matter much more quickly. Postharvest planting of cover crops is a way to protect and enrich soil. Not only do they cover the ground during winter months, but they have biological benefits as well. Cardon added that a good cover crop rotation will also reduce the likelihood of disease, pests and weeds. “That reduces the need for chemicals,” he said. Cardon was asked what makes for a good cover crop selection. He said a mix of a legume, such as clover or Australian winter pea, with a variety of grass, such as one of the bromes, is considered a good way to go. You get this contribution from the legume with nitrogen buildup and enhancement of soil nitrogen storage,” he said. “Grass crops have deeper roots zone so you can take excess nutrients and break them up into the soil red zone and turn them back into a slow-release nutrient. The presence of earthworms is the more simplistic (and cheapest) way to detect healthy soil, Suarez said. He recommends the mustard test of mixing dry mustard with water, which will draw earthworms to the surface. The presence of mycorrhiza, a white-colored fungus, also is a good indicator. Cardon echoed earthworms as a good sign, and added that healthy soil is typically darker. He also said scientific study has shown that inhalation of certain soil bacteria release endorphins in the human brain, giving humans sort of a natural indicator. “They have such a sweet, fresh smell,” he said. There are, of course, much more scientific and in-depth ways to measure soil in laboratories, which, as Suarez noted, tend to come at a cost. Again, he stressed ROI when it comes to soil monitoring. Unless the measurements are driving decision-making, they are unnecessary.